The Railways Department has decided to develop the Northern Railway Line as a dual carriageway under a project funded by the Indian Government. General Manager Railways stated the railway line from Polgahawela to Kurunegala would be developed with double line under Stage 1 of the project and from Kurunegala to Maho under Stage II. The railway line from Maho to Omanthai would also be developed under stage III. the four Indian companies had forwarded tenders to undertake the project and the evaluation of tenders would be finalised soon. He said the decision was taken to award the contract to the Indian companies as the project would be funded by the Indian Government. He further said that the main line to up- country would be developed as a dual carriageway from Kadugannawa to Kandy under a project funded by the Indian Government. The procurement process initiated in January had only attracted two proposals and the Ceylon Shipping Corporation and Cabinet Appointed Negotiating Committee had recommended that the previous procumbent process be cancelled and fresh bids be called for. It was pointed out that not much interest had been generated towards the project initially due to inadequate publicity provided to it. The Ferry Service which used to operate prior to the war came to a standstill with the breaking out of hostilities in the North. In 2011, the government decided to relaunch it but was soon stopped due to less traffic. But the Foreign Affairs Ministry this year said it will also consider freight service in addition to passenger services, to make it more economically viable. The ferry service is an important project for both countries across the Palk Straits as an initiative which will not only increase connectivity between the two countries but also one that would be both culturally and economically significant. The Andhra Pradesh Government of India is contemplating setting up an industrial corridor in Sri Lanka, the Indian Express reported recently. Officials also said Sri Lanka was the best bet for AP for conducting trade in sea foods, pharmaceuticals and tourism sectors as Sri Lanka is strategically located. And the news said the Sri Lankan government may allocate land to the AP government in Jaffna or Trincomalee for this purpose. The Sri Lankan government is also planning to invest in AP in the textile and aviation sectors through a mutual trade agreement. “The MoU will be signed shortly for implementing the AP special economic zone in Sri Lanka. There are good opportunities to invest in the pharmaceutical and tourism sectors in Sri Lanka,” Industries Minister Reddy said. Indian Railways has got the export order of supplying 10 locomotives and six DMU train sets to Sri Lanka. The total size of the order is INR 700crore. Rail India Technical and Economic Service (RITES), the subsidiary of Indian railways, which had already been working as a consultant in Sri Lanka has got the order. Indian Railways have already provided locomotives and train sets to Sri Lanka and had also undertaken construction of rail lines in Sri Lanka. The construction of 4,000 housing units for needy families in the Plantation Sector, sponsored by the Indian Government, is slated to begin in March, Estate Infrastructure Development Minister P. Digambaram said. The minister said the construction of the houses for estate workers in the Central Province and Badulla district will be flagged off next month possibly by Indian Prime Minister Narendra Modi himself during a likely official visit to Sri Lanka. The 4,000 houses is part of a 50,000 housing project implemented by the Indian Government for the former conflict affected people in the North and East Provinces and needy families working in the estate sector in the Central Province and Badulla district. With a commitment of over US$ 270 million in grants, it is the flagship project of India’s developmental assistance to Sri Lanka. It is perhaps the largest such project undertaken by India anywhere in the world. Minister Digambaram said around 35,000 houses in the North and East under this project has been already constructed, it was yet to get off ground in the estate sector. The minister also said the delay in implementing the project in the plantation areas was partly due to the inefficiency of the political authority who earlier held sway in the upcountry plantation areas. The minister said soon after he had assumed office, he had taken steps to hold talks with the relevant officials to speed up the building of houses for needy people in the estate sector. He said choosing housing recipients will be done in a very transparent manner which ensures that there are no discrimination due to political or other factors. The Ramayanaya trail will be re – launched by the Sri Lanka Convention Bureau together with SLTPB and Srilankan Airlines in the coming months. The 14 sites accessible out of identified 52 Sites will be heavily promoted through various itineraries and packages. The traditions of the Ramayana form an integral part of the shared cultural heritage of India and Sri Lanka. Major part of the Ramayana Episode has taken part in Sri Lanka and therefore Sri Lanka has special significance in the Ramayana Epic where pilgrim tourism can be promoted from India. The sites include the places where Sit ha Devi has travelled to, consisting of archaeological areas, caves, mountains and temples which are of immense interest to Hindus. Sita Eliya, Ravana Ella, Hakgala, Maligatenna, Roomasala, Sitawaka and Kelaniya are some of the prominent localities associated with the Ramayana traditions. During the last few years, India became the primary tourist and MICE tourist generating market for Sri Lanka . To cater to Indian market, Sri Lanka Tourism structured many new tourism products. Facilities for Corporate meetings and Incentives were among them. The government of India has reduced the entrance fee to the National Museum of New Delhi for Sri Lankan nationals to INR 10.00 from the current rate of INR 300.00 , the Indian High Commission announced to news. The High Commission said in a statement that Indian Prime Minister Narendra Modi had taken the decision during the visit of Sri Lankan President Maithripala Sirisena to India, after noting that Sri Lankan Nationals visit the museum in large numbers to pay homage to the Kapilavastu Relics. 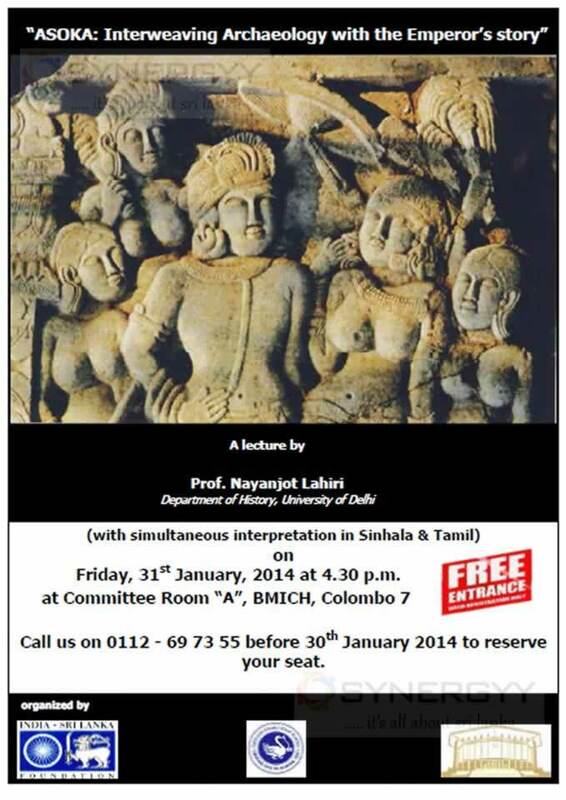 In pursuance of the Prime Minister’s announcement, the entry fee to the National Museum for Sri Lankan nationals had been reduced and brought on par with the fee paid by Indian Nationals. The new rates will come into effect from April 1. 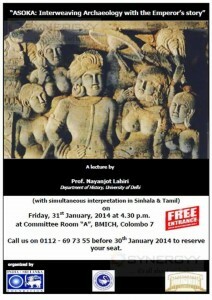 Sri Lankan nationals will thereafter have to pay a nominal entry fee of INR 10 (against INR 300 currently) to view the rich and varied collection at the National Museum. Sri Lanka is the only country to be accorded this special status. Srilanka is a fast growing tourist destination in South Asian country which attracts more Sri Lanka Honeymoon Packages and Typical Sri Lanka cultured wedding Packages. In addition to that Sri Lanka cater to all needs of your tourism in nature, Beaches, Wild life safaris, cultural tours, Sri Lanka History tour, Honeymoon Tour, Education Tour and Shopping tours within this tiny island. But for last 20 years Indian Tourist to Sri Lanka is keeping as higher number of foreign tourist arrivals, these days the Indian tourist arrivals denoted about 16% of total tourist arrivals of Sri Lanka tourism. Flights are quite affordable, A Delhi-Kochi return fare for weekend would cost INR 16,905 while a Colombo return would cost INR 22,576. Plus, of course a ‘foreign’ tag to boast about. The Emigration and Travel Approval or ETA, equivalent to a visa, is online and comes in minutes. Immigration clearance in Colombo is a breeze with travellers getting a free SIM card. Booked online with no advance required – all payments on arrival. The rates for decent three to four star hotels range between INR 7,000 and 12,000 with breakfast and wifi free. The expressway to the city from the airport is a smooth drive. Cars can do up to 120 kmph on the southern expressway though many prefer the longer, more scenic route. Highway to Jaffna also good. On the occasion of India’s 66th Republic Day, a Hag hoisting ceremony would be held at India House (No. 86, Kumaratunga Munidasa Mawatha, Colombo-3) on Monday, January 26th, 2015 at 0830 hours. All Indian nationals and their families are cordially invited to participate in the function and are requested to reach the venue latest by 0800 hrs. To facilitate entry into India House, they are requested to bring their passport or any other photo identity document. 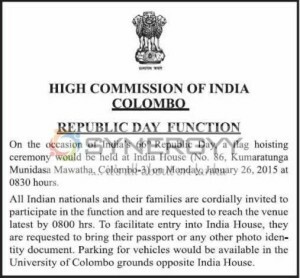 Parking for vehicles would be available in the University of Colombo grounds opposite India House. Plans are underway to have shipping and an air link between in India and Jaffna soon said Consul General of India in Jaffna, V. Mahalingam stated in Jaffna International Trade Fair 2014. In 2011-12, India’s imports from Sri Lanka went up by almost 45% to cross USS 720 million, making Sri Lanka the largest source of merchandise from the South Asian region for India. This is a big jump from USS 45 million imports in 2000-01, when Sri Lanka occupied the fourth rank as an import source for India in the region. There is no doubt that the FTA brought significant benefits to both sides. Tourists travelling to India from 180 countries will no longer have to queue at their local consulates to obtain visas; most foreigners currently have to wait several weeks before learning whether they will be allowed to enter India after submitting their applications at visa processing centres, a major deterrent for potential visitors. Visitors from countries which account for the bulk of India’s tourists – such as the United States, Britain and France – that have had to go through the time consuming process of applying in person will be among those to benefit from the changes to regulations. India on Wednesday cheered the appointment of Satya Nadella as the new chief executive of Microsoft, Nadella, who became the giant company’s third CEO on Tuesday, was born and grew up in the southern Indian city of Hyderabad and studied at Mangalore University before shifting to America to further his studies and career. “India makes a power point, said a proud front-page headline of the Times of India newspaper about the 46-year-old cricket lover’s appointment. Srilanka Railway is preparing to operate railway services up to Kilinochchi from Mid September 2013, and 87% of the Omanthai to Palai railway track have been complete and expected to complete the 100% by End September 2013. This would be great Development to residents in Northern Province and suborns. It is encourage to business communities to buildup their business relationships with north and South in terms to develop better trading in Northern Province. 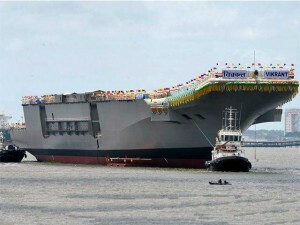 India launched its first indigenously-built aircraft carrier on Monday, a landmark moment in the $5 billion project that seeks to project the country’s power and check the rising influence of China. 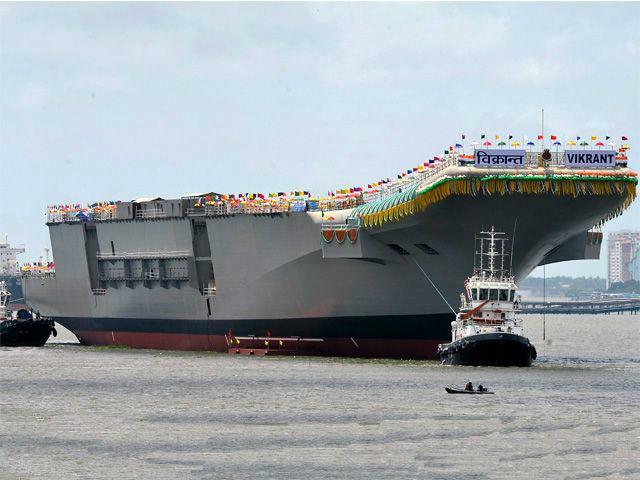 The Air Craft Carrier Vikrant is 40,000 tons weight itself to named India as a 5th Nation having Air Craft Carrier building capacity inclusive of Britain, France, Russia and the United States. The Government of India is looking forward to used support in land wars, defending strategic supply routes in the gulf and elsewhere. And it is to strength the defence of the India far falling islands and safeguard Indian interests in Africa and Asia. 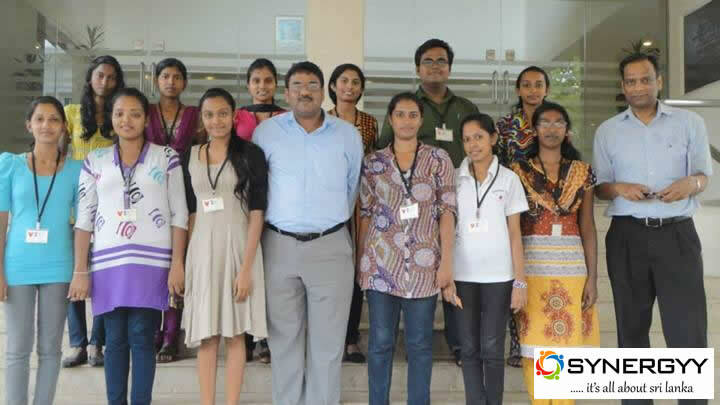 The High Commission of India in Colombo announces there are 12 Students were selected to continue the educations in India with Indian Scholarship scheme. Tamil Nadu, India HSC +2 March 2013 examination results will be released on 9th may 2013 at 10 am morning. Hope the service will be restart at minimum price and delight the ship travelers. The Sri Lankan Government looking for possibilities to move its Deputy High Commission in Chennai, Tamil Nadu to Trivandrum, Kerala state. The move comes after the anti-Srilanka sentiments in Tamil Nadu in recent days. with the help of central government of India the High Commissioner assure that police in Tamil Nadu had been advise to provide maximum protection, so srilankan and They would not face any untoward incidents as past. 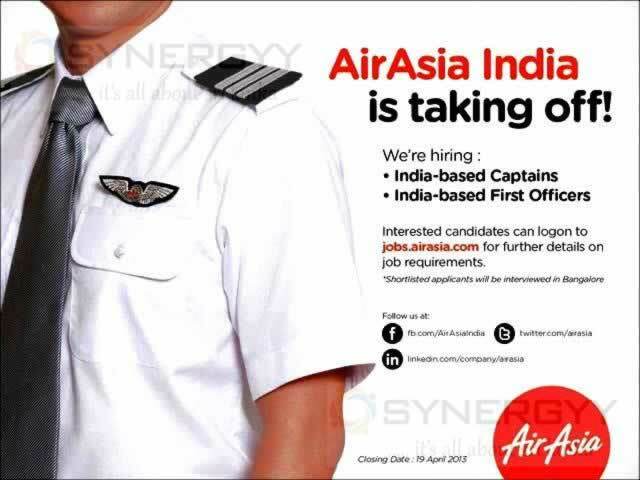 AirAsia has found an Indian partner to open an AirAsia India operation in India for Domestic and International operations. The AirAsia has teamed up with India’s Tata group and Hindustan Aviation to set up a new airline to be known as AirAsia India. In the deal, the Indian parties will take 51 % equity stake while AirAsia will hold the remaining 49 %. Which is the equity it normally takes in its foreign joint ventures. Of the 51%, Sources said Tata Group will have 30% stake and Hindustan Aviation 21% equity stake. The three parties is said to have signed the partnership agreement this week and have submitted a proposal to the Indian government to seek a domestic air services licences also this week. The Defense and Urban Development Ministry with supervision of Sri Lanka Navy made facilitations to place to hold the annual feast of St Anthony’s Church in Kachchathivu Island on 23rd February 2013. Over 10,000 Indian Devotees are expected in this year St. Anthony’s Church festive this year. This is one of the traditions festive from ancient where Sri Lankans and Indians are take parts of the festive. The U.S Consulate centre, Mumbai organizing TechCamp Mumbai 2013 a South Asia regional conference on February 19- 21st 2013. The event will be focus on the theme of youth empowerment through 140 international technology experts for highly motivated NGO participants from India, Pakistan, Afghanistan, Nepal, Bangladesh, Srilanka and Maldives. The TechCamp Mumbai 2013 will provides low or no cost new and online technology training to help them address some of the most pressing social changes in south asia. 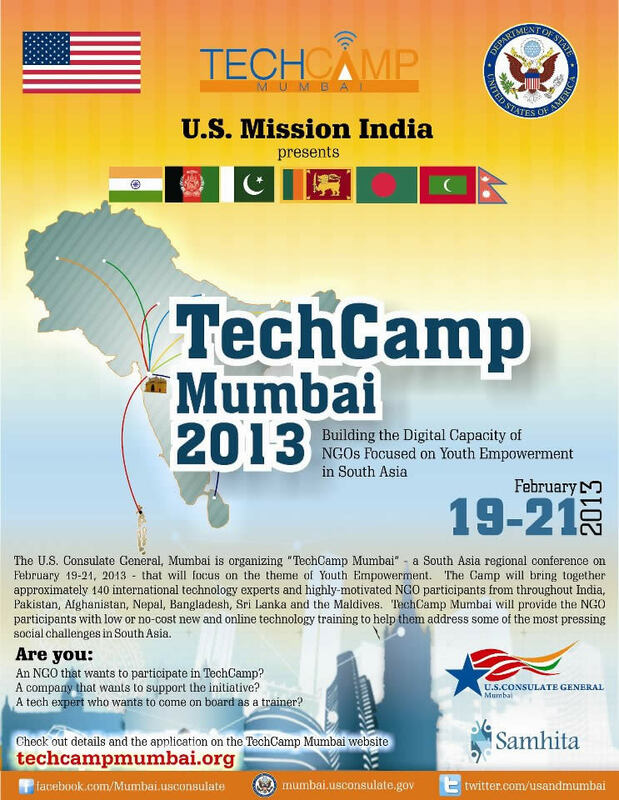 See below image for more information about TechCamp Mumbai 2013 and process to participate.